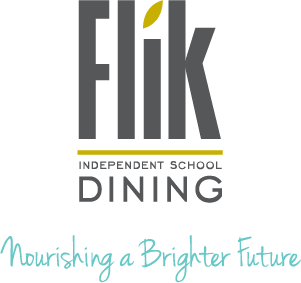 The New School is proud to partner with Flik Dining, an independent school dining service, which specializes in providing fresh meals that support local and sustainable agricultural practices. Head Chef Sarah Roe Voorheis started her culinary career more than 20 years ago and has worked as a chef at the University of Arkansas and in Ithaca, New York. Flik prepares food from scratch, limiting the use of processed foods and avoiding foods containing artificial flavorings, MSG, preservatives and high levels of sodium. For more information on Flik's nutrition philosophy and food, visit flikisd.com. Flik's menus are updated weekly to take the best advantage of local ingredients. Menus are divided into Preschool - 1st Grade, and 2nd - 9th Grades. To view current menus, please visit myschooldining.com. My School Dining is also available for your mobile device.